Did I mention it is raining here? Interminable, unrelenting rain that goes on and on and on and doesn’t stop and just keeps pounding down and drenching the landscape and putting all my Gore-tex to the test. It makes me think back to The Ridge in January 1995 (the time of the first Capricorn Party!). Driving to Rough & Ready from Corning over roads under water and staying a few days longer than anticipated because I couldn’t get home. Later that same month I was stuck in a Red Cross Shelter in Red Bluff as the Seven Bridges on the way to my house were under water. (Didn’t someone write a song about that road?) It was pretty wet and wild up on Wild Pig Ridge that winter. After I finished the last of the library books and had enough coziness in the tiny trailer, I just geared up and went out to Embrace The Storm. It was magnificent. Came back with both of us soaking wet down to the underwear (me) and skin (Babe). I remember thinking then how nice it would be to have hot running water and be able to take a shower after such an adventure. Now…I have such. A cozy home with warm reliable heat and hot running water and a very nice shower and an electric stove to heat the water for tea. Such luxury. So off we go into the eye of the storm. Because…what else can you do? May you prosper! This is the Year of the Red Dog in the Chinese calendar. Chinese New Year begins at sunset following the first New Moon after the Sun leaves Capricorn and enters Aquarius. In the United States, the Chinese year 4704 begins on Sunday, January 29, 2006 at 6:15 a.m. PST. You are under the sign of the Dog if you were born in 1946, 1958, 1970, 1982, 1994. Those born after today in 2006 will be included, but those born in January before this date are still in the Year of the Rooster (2005). Those born under the sign of the Dog are faithful and friendly. They are principled, trustworthy and nonmaterialistic, with a strong sense of right and wrong. People born in the Year of the Dog possess the best traits of human nature. They have a deep sense of loyalty, are honest, and inspire other people’s confidence because they know how to keep secrets. Here in Portland, many celebrations are planned at the beautiful Chinese Garden, including the Lion Dance. Not as spectacular as San Francisco, where the Chinese New Year’s Parade is quite an event. Nevertheless, here on the West Coast it is an important holiday. Gung Hay Fat Choy. Some days you just want to sit on the couch and watch mindless TV and eat a whole bag of Cheetos all by yourself. Today is such a day. No creative spark, no ideas waiting backstage, no energy to write. Time to put on the plaid flannel pants and sweatshirt and vege out. The dogs are twin “cinnamon rolls” on their twin beds, and the cat is asleep on the heating vent under the buffet. We are in for the night and on stand-by mode. Zzzzz. Today, if you have a wee bit o’ Scottish heritage, you will drink a toast (Scotch, of course) to Scotland’s national poet, Robbie Burns, to commemorate the day of his birth, January 25, 1759. A much revered poet who celebrated nature and the enjoyment of life, his poems are still popular in the 21st century. At the ceilidh (party/concert/dancing) in his honor, you may want to skip eating the haggis (see next paragraph), but you might enjoy dining on bannocks (oat cakes), neeps (turnips) and tatties (potatoes). If you are lucky, someone with a nice Scottish burrrr will read Burns’ Ode To A Haggis, in Gaelic. Haggis is made from sheep's offal (or pluck). The windpipe, lungs, heart and liver of the sheep are boiled and then minced. This is mixed with beef suet and lightly toasted oatmeal. This mixture is placed inside the sheep's stomach, which is sewn closed. The resulting haggis is traditionally cooked by further boiling (for up to three hours) although the partly-cooked haggis can be cooked in the oven which prevents the risk of bursting and spoiling. True Scots really do love it, although vegetarian Scots not so much. Gaelic: By the way, just in case you are referring to the title of this piece, the first syllable of the name of the language of the Highlands, Gaelic, is pronounced gal as in gallon, not gale as in storm. Try it: Gal-ick. Please join us, no matter what your heritage, in celebrating this event. On Robbie’s birthday, we are all Scots! And I have found this to be true. And lately I have a new favorite…Rooibos herb tea. It’s brewed from the leaves of an African shrub and is also called “Red Bush Tea.” If you remember, I mentioned before books by Alexander McCall Smith that are set in Africa. The main character, Mma Ramotswe, fancies a cup of Bush Tea every day. It smells enticing and has a fruity flavor with a touch of ginger and cinnamon. Thanks to the workings of a forward thinking business in Boulder, Celestial Seasonings, this bracing beverage is now being marketed as Red Safari Spice Tea. Try it. 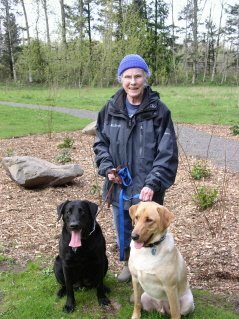 Even if you are not troubled, it is a nice pick-me-up in the afternoon, especially on a rainy Saturday in Oregon after returning home from a walk in the mist with the dogs. Yesterday we explored the Springwater Trail, part of the Johnson Creek watershed. The Creek is the nemesis of many who live along its banks as it tends to burst its bounds on a regular basis. In fact we parked near the sand bag station and saw many families availing themselves of the free service. The trail follows the Creek and goes from Hogan (my street) all the way to the banks of the Willamette and the Sellwood Bridge. Paved and lane-striped it is a bikeway and walking trail that is part of the Rails-To-Trails project here. Similar to the KATY Trail I hiked on in Missouri. During tax season, it is hard to get out during daylight hours so this was a rare treat for me and for the dogs as well. Little Buddy has benefited from the classes, and now heels very nicely as we hike along. Now, at home on a gloomy Sunday, with football on TV, a puzzle on the dining room table, and a good book on the coffee table (The Kite Runner), a cup of tea is just the thing. Or make that rain. Rain is like a headache…you are pretty aware of it when it is going on, but it is hard to pinpoint the exact moment when it is gone. Suddenly you realize the pain/rain is no longer there. Night before last night, I woke up about 3:00 a.m. and realized it was unnaturally quiet. No drops drumming on the roof, no rivulets streaming down the window pane, no gutter overflow dripping. The rain had stopped. Providing a brief respite and a Gore-Tex-Free Day. The paper advises us that it has rained 30 of the past 31 days. That is quite a bit of water whirling around. The Willamette is overflowing and the Columbia lingers near flood stage. It is impossible to talk about much else. Especially for those folks whose houses are flooded or washed away down the hillside. Scenes of frantic homeowners desperately shoveling mud or filling sand bags on the news every night. Certainly spending time in nature out here requires an awareness of wetness. And being outdoors for any reason is an exercise in maintaining dryness. This is Oregon Winter and the rain is what makes the Northwest so green and beautiful. But it is nice to have a break and walk the dogs without an umbrella. There’s more to come and Winter is long from over. But on the plus side, I have not needed my Cabela down coat yet and the temps are much milder than the Midwest. No snow shoveling. No four-wheel drive to get home after work. I count my blessings and damp is a notch up from frozen. It’s too late to save your socks! High Water State of Emergency in Oregon. The TV news is full of shots of rivers out of their banks, sewers and drains backed up, hillsides turned into hill slides, mud and rocks on roads, and an angry sea tossing large logs like toothpicks. And to think I moved out here to escape the wicked winters of the Midwest. Friends write that it is a mild winter there with temps in the 50s. But you should know I have not been adversely affected here other than being a little damp around the edges. The flooding has not reached Wood Village, my daily travels are not complicated by road closures, my roof does not leak, and no trees have fallen on my house. In fact…I am warm and cozy, tucked in my Hideaway. Today I am looking at the bookshelf where SEVEN Christmas gift books sit waiting to be read in quiet moments. The pantry is well stocked and, of course, I still have my emergency kit from Osceola with flashlight, blanket, etc. I have a stash of yarn on hand for knitting, a quilt under way, the daily crosswords, cable TV with hundreds of channels, and…starting very soon…high speed internet. Who could ask for more? Tonight as the full Wolf Moon rises, I hope each of you are as well situated and content. We always knew it rained in Oregon (duh! ), but this season is setting records. The Northwest (including Northern California) is being pounded by steady, unceasing, incessant, drenching, unrelenting RAIN. Here in The Gorge the old Columbia Highway is closed due to mud and rock slides. The cat driver clearing the road was almost killed when a second slide buried his huge earth mover. This is the road we drove last weekend to show our houseguest the beauty of the region. The Sandy River (two miles away) has flooded and jumped its bank and run amok. Cars are hydroplaning all over Interstate 84. So far the Columbia is contained as it flows by here, but it has reached flood stage about twenty miles downstream. It is vicious out here. A Gore-Tex time indeed. Here at The Hideaway we are almost high and dry thanks to a good system of sewers and drain pipes and places for the water to go. The covered porch and deck are a godsend. The yard of course is a muddy mess, but it is flat and not sliding anywhere. Once again I have planted myself in a spot that is seemingly impervious to the wild weather. My drive to work does not involve the freeway or any flooded roads (darn!) so I come and go without incident. Nevertheless, it is damp and discourages outdoor activities. But Princess absolutely loves the lake that falls from the sky and she revels in the rain. Buddy romps and plays the same as in the sunshine. Windy and I are outfitted by Columbia (and some leftover Nike) and venture to the park to throw a soggy tennis ball and let the dogs exercise while we get drenched. Mt. Hood has stayed hidden and draped in fog and clouds during all this. If you stare at just the right spot in the clouds long enough you can see the image of the mysterious mountain. It is there, anchored firmly against the storm. As are we. Every day as we watch the news we give thanks for our safety and good fortune as others lose their homes. We are blessed. After glorifying the joys of retirement and long lazy days, I now find myself back at work from 9:00 to 5:00. It’s a rough adjustment and I am still trying to master the logistics. I miss my second cup of coffee at home with my computer or my crossword. Now I am taking it with me in the snazzy commuter cup I got for Christmas. I miss the afternoon walks with Princess. Now I get my exercise walking around the mall, and Princess waits to go to the park on the weekend. I can’t seem to catch up. The Blog is neglected, correspondence long past due, bills unpaid, groceries not bought. Thoughts not thought. I have to say that working certainly interferes with living my life. It does, however, pay money which is the only reason I would go out the door in the morning. The Block office is 3.5 miles from my house, a straight shot across Hogan from Sandy to Burnside. An easy commute compared to the 25 miles each way I drove on Highway 13 last year. I can come home for lunch and let the dogs out. Pick up the mail. Run a quick errand. So, all in all, it is not too bad. Except that it is work. The creative muse seems to want to visit me in the morning right when I need to get ready to leave the house. So the Blog will be sporadic the next few weeks. Please be patient and keep coming back on the off chance you will hit a day I have posted a random thought or two. What would you call people that age? Senior citizens? Elderly? Old? Over the hill? Your parents? Yourself? Your kids? Where you are on the spectrum of aging might make a difference in how you answer. As I approach the end of my “sixties” decade, I lack the vocabulary to describe myself. Certainly I chafe under the label “senior.” Or worse yet, “elderly.” Partly because they have such negative connotations. “Senior” brings to mind women in ugly shorts and visors playing golf in their retirement village or befuddled old women filling out Publisher’s Clearinghouse entry forms at their kitchen tables. And “elderly” brings to mind someone drooling in her soup in the back corridor of a dingy nursing home. I don’t care much for “little gray-haired old lady” or “honored citizen.” “Grandmother” makes me want to scream, as does “granny” or “grandma.” Which, by the way, I am not. So who am I? Who are we? We’ve finished raising our children, completed our contribution to the workforce, sorted The Stuff, sold our homes, taken that cruise, caught up with all that reading, made up our sleep deficit, started (and probably forsaken) a new hobby, moved to a warmer climate, bought an automatic transmission car (or a hybrid), and if we are lucky we still have funds stashed away for the Rainy Day that has not yet arrived. If we are not so lucky (as many are not), we live at the edge of poverty and face declining health and a fast-changing world that leaves us behind. Gail Sheehy calls this the “Second Adulthood” and the “Age of Mastery.” She’s the guru of the passages of life. Nobody expected us to be here. The designers of the Social Security Act thought we’d all be dead by this age. Ditto Medicare. But here we are, depleting the Federal budget and toodling along into our dotage. How about “Survivors?” For we are that. Every morning I wake up and say, “Wow. I made it way past the finish line and I’m still in the race.” So I am nearing the half-way mark in this three- to four-score phase of living. And I still don’t know what to call it. What would you call people from 60 to 80 years of age? Let’s be creative here! "Peace and tranquility reign supreme." If you have known me for more than a day, you will know how thrilled I was to see that prediction for this misty Oregon morning. I am enjoying being here in my cozy Hideaway with beautiful Celtic music playing, incense burning, dogs and cat sleeping contentedly, a puzzle on the dining room table, a book to read, crocheting in my basket, the Sunday paper on the coffee table. It was a long road to get here, but worth it. I wish each of you….wherever you are…the same peacefulness and tranquility. We are connected by the threads of this Blog and our memories and shared experiences and the crossings of life’s paths. A wonderful web of friendship. High speed, low speed? Read no speed. On December 31st our paid account with our former ISP expired. Our new hook-up didn’t kick in until after the holiday(s) on the 3rd. That only after an hour’s worth of phone calls and experiments and Tech Support walk-throughs. No sooner were the kinks worked out, than the house phone line went out bringing the Internet and land line communications to a standstill. That problem got fixed on Thursday about fifteen minutes before our houseguest arrived and computer problems were shuffled to the bottom of the list. It is, though, a welcome relief to return to boredom which has its value as a balance for all the excitement. Can you believe it is Two Thousand and SIX? Only yesterday we were worrying about Y2K. Bear with me here. I am putting up the postings that got skipped because I already wrote them and I like them and I know you missed your daily dose of musings. So let’s work our way back past Epiphany and the 2nd to New Year’s Day. Wash, pick over, and soak overnight 1 pound dried black eyed peas (or cheat and buy some canned ones). Add onion and some cayenne pepper if you want to scorch your throat. Meat eaters sometimes add a big hunk of salt pork or bacon fat. Mix with cooked white rice (or brown basmati rice if you are a health nut) and eat as directed above. Happy New Year and may good luck be with you.